Well, if we ever need something huge built on a RepRap, now we know who to call. [Jim] over at Grass Roots Engineering wrote in to share a large 3D print he just finished, which was extruded by an equally impressive home-built 3D printer. The part he built consists of a bunch of hollow green tubing in a criss-cross pattern and was printed in just under 2 days. He never mentions what the part is going to be used for, but at 376 x 376 x 250mm (14.8 x 14.8 x 9.84in), he estimates that this is the biggest single part printed with a DIY 3D printer. The printer itself is based on the RepRap, but is obviously far larger. It prints using ABS plastic utilizing a maximum build area of 403 x 403 x 322.7mm (15.86 x 15.86 x 12.7in). Built over the course of 3 years, it was fully operational in 2010 but has undergone several improvements as [Jim’s] needs have changed. It’s a fantastic looking machine, and it seems to print quite nicely. We would sure love to have one of these in our workshop. 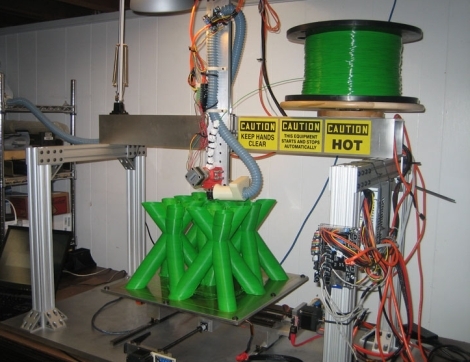 Continue reading to see [Jim’s] 3D printer in action. Slap a nice piece of glass on top and you’ve got yourself a sweet coffee table. A nice big printer. Too bad it took 48 hours to print that… Nice timelaps. And of-course, everything has a start. How hard is it to unscale a 3D printer? I’ve heard some rumours about a 1m^3 ultimaker.. It doesn’t say it will need the same precision. Not an Ultimaker, but LeBigRep (http://lebigrep.org/) also has a cubic meter build volume. There don’t appear to have been any updates for a couple of months though. Is that weedeater line he is using as a source? No sir it’s ABS plastic, PLA can also be used. Most likely from a company called Makergear but hard to tell since he has a HUGE roll. It was some early photos of this printer that have inspired me to build a large 3D printer myself. Alas I only have a few of the parts collected and school/work keep me from devoting any substantial ammount of time to my project. This only serves to help motivate me to work harder so I can scrape some time together to work on my next printer too. It is an impressive feat for a 3d printer to have created such a large object and I applaud Jim’s achievement. It was nice of him to include some of the skeinforge export data. I am a bit surprised to see such a low average feed rate. With a bit of tweaking I wouldn’t be surprised if he could double that and half the build time. Granted that depends on the mass of his build platform and the torque of his motors. I would have much rather seen a stop-motion/fastforward with the frames synchronized to the layer changes (if it draws the same direction each time). It starts drawing at a different location every layer. This is because at a layer change a tiny bit of extra material is extruded. Which isn’t a problem, unless it all accumulates at the same location. I am surprised at the moving platform. Because the whole platform needs to move it takes a lot of space. And you’re moving a slight warm plastic object around, which can cause your print to move during printing. I hope to get my Ultimaker this weekend. When I have it assembled and it’s working I’ll attach a webcam and make stop motion per layer like you suggested =) sounds like a good idea. Why not add another print head to double the speed if you are making one that big? Or is that more difficult to write g-code for? One thing that occurred to me was to wonder if the extruder head could have an iris, so you could set the horizontal scale of the extruded plastic. Could you back it up with a piston, that would push the required amount of plastic out, then have the iris close completely between pushes, to eliminate ‘tails’? Dear lord i want a 3d printer… it would help sooo many of my other projects along. Holy cow that is impressive!!! That makes my reprap look very tiny!!! Commercial Objet machines can do up to 500mm X 400mm X 200(19.7 X 15.7 X 7.9 inches). But for a DIY project, that’s a pretty decent build size! It beats the Objet in Z as well. How accurate can you get using 80/20 like that? It still has a non trivial amount of flex once you start increasing spans past a fairly small amount. Yeah, sure 80/20 can have a little deflection over distances, just like all materials really.. but how accurate are you wanting exactly? I’ve seen plenty of successful CNC builds using 80/20 over 8 foot distances which manage to maintain tight tolerances when cutting. I’ve had to add a 2nd piece coupled to the first on my 8 foot axis to strengthen it enough for my liking but I also have cutting forces to deal with which a 3D printer doesn’t. I’m confident in saying that the builder has very little to no flex in the 80/20, but if he did it would be simple to reinforce and relatively cheap. I’d personally be more wary of the rectangular aluminum he uses on the longer axis, but even that looks to be .250 thick and without cutting forces I can’t imagine it being a problem. I think the only question I still have is if the aluminum base he uses is just standard 6061 or surface ground aluminum. It looks like 6061 to me. As someone who is also pretty obsessed with accuracy I’m quite aware a standard piece of aluminum 6061 is not flat but can vary up to .01″ or worse. I also can’t see a reasonable way to hook up indicators to shim it perfect without a giant granite surface plate. So to me the base is going to cause more variance then the 80/20, not that I’m worried about that either though. Instead of extruded stock in 6061 or 6061 in sheet, buy cast tool and jig plate. Alro steel has it, for one source. It is very, very flat and the coefficent of expansion is better than extruded stock or sheet. It costs but you save blanchard grinding costs. I keep wondering if it would be possible to create multiple nozzles or something to reduce or eliminate the travel time. This by allowing printing in multiple locations at the same time. I’m more interested in what software is used to control the thing. RepG and skein absolutely choke on big objects and big build areas. skeinforge is used according to the blog post. Guess they are just patient. No wonder it took two days to print if he uses leadscrews to drive X and Y axis. Anyway the print itself is amazing. Just this printer design uses high quality parts so unefficiently :-/ It could do much better. I think this is a storage tote for rakes, shovels and other yard tools. They can be put in here handle end down, and the angles of the tubes make the handles diverge outward to make space for the tool’s end such as the broad end of a leaf rake, for instance. The large diameter of the tubes allow space for the much smaller diameter of the handles. Dunno. this is what i really need to build a robotic arm oh the fun to be had.